Electric Skiff 15 is a new design for efficient powering using a stock electric trolling motor. 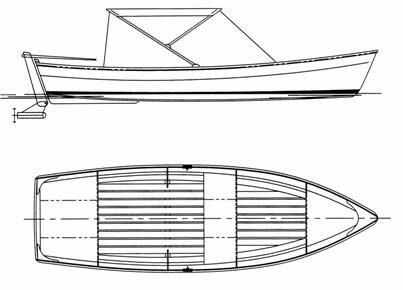 Her rocker bottom and shallow run will be more efficient under electric power than skiffs and johnboats designed for outboard power. She is stable and roomy for cruising, fishing or just messing bout with family and friends. Three type 27 deep cycle batteries and a 36 VDC system will provide enough electricity to cruise at 4+ knots for 8 or more hours. Construction is stitch and glue plywood and epoxy, quick and simple. Foam filled compartments are provided forward and aft for level floatation. A storage compartment is located between floatation in the aft seat. Plans for a rudder mounted motor are included as an alternative to steering by thrust of a trolling motor. Go green, make a difference and have fun too! Estimated cost for quality construction materials (not including power) is $2500. This cost includes a high level of outfit and finish you can be proud of after putting the effort into building this fine boat. Purchase Study Plans for the ELECTRIC SKIFF 15 for $5.00 for delivery by US Postal Service [no download file available]. Purchase Construction Plans for the ELECTRIC SKIFF 15 for $70.00 for delivery by US Postal Service. Purchase Full Size Frame Lofting for the ELECTRIC SKIFF 15 for $70.00 for delivery by US Postal Service.